Measuring a person’s social impact is a hot topic at the moment, courtesy of the explosion of social media and our collective desire to analyze and measure the world. Now comes Identified, the “first product to measure how ‘in demand’ you are to companies right now,” according to its press release. It is, practically, a score for how hot a property you are as a professional–an enterprise, and much more personal, layer of influence than social media-centric measures like Klout or PeerIndex. The system works like this: By accessing Facebook for whatever information people are prepared to share publicly, a basic Indentified profile is made. Then, when an individual signs into the service, they are offered the chance to enter more information about themselves–from their current jobs to their sports and leisure interests. This information is used to add to and refine their score. 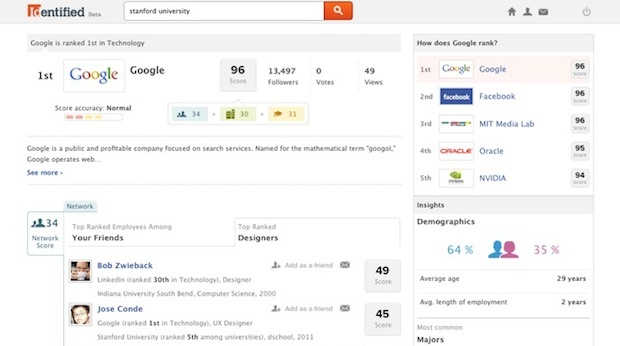 Companies have a separate access portal to the system, which offers a “channel of communication between companies and professionals that doesn’t exist on LinkedIn, job boards, career centers, or résumé databases.” Individual users also get a summary of which companies have been looking at their profile, hence “Identified is the first tool to provide people with real time, interactive feedback on how companies evaluate their professional information.” Which means if you’re in the market for a job your Identified score might be a key to unlock certain doors, and the entire process could let you refine how you present yourself in order to make yourself more attractive. But the key to all this working well is ubiquitous personal data, something users can be wary of sharing (with Facebook’s frequent privacy debacles as exhibit A). We spoke with Identified cofounder Brendan Wallace about this, and he thinks this won’t be a problem for his service.